ANKARA (AA) - Venezuelan President Nicolas Maduro asked Americans for support to avoid a “new Vietnam” in a video message Wednesday. "I want to send a message to the people of the U.S. to alert them to the campaign of the media, communication, and psychological war that the international media are developing, especially the U.S. media against Venezuela," said Maduro. “I ask for the support of people of the United States so that there is not a new Vietnam. “They [the U.S.] want to put their hands on our oil like they did in Iraq, like they did in Libya,” Maduro said, referring to fact that Venezuela has the world's largest oil reserves. Earlier Wednesday, Maduro said he is ready to negotiate with self-declared president Juan Guaido in an interview with Russian news agency RIA Novosti. 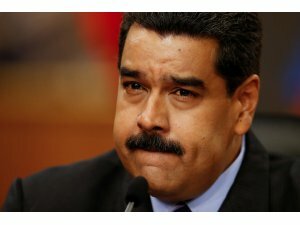 “Maduro willing to negotiate with opposition in Venezuela following U.S. sanctions and the cutting off of oil revenues. Guaido is being targeted by Venezuelan Supreme Court. Massive protest expected today. Americans should not travel to Venezuela until further notice," U.S. President Donald Trump tweeted. The U.S. ordered the freezing of assets belonging to Venezuela’s national oil company, PDVSA, and prohibited, with a few exceptions, American citizens and companies from carrying out business with it. Venezuela’s Supreme Court barred Guaido from leaving the country and ordered a freeze on his financial assets. Last week, Guaido, the leader of Venezuela’s opposition-led National Assembly, declared himself president, a move immediately supported by Trump.